After green-lighting many shows with vampires as sexualized, sultry, sparkly beings, it’s about time network TV showcased some bloodsuckers with teeth. Not that there’s anything inherently wrong with the pretty vampire — the formula certainly worked for The CW’s wildly successful Vampire Diaries series and its subsequent spinoffs, and it may be successful yet again with the network’s recently announced pilot for The Lost Boys. But there’s not much shared DNA between Stefan and Damon Salvatore and the "Virals" on Fox's new drama. There has been a distinct lack of scary vampires gracing our screens during primetime, especially on major network and broadcast television. Instead the thrills and chills have been left largely to zombies, serial killers and creepy clowns. The Passage has changed that. A twisted history with one of the main Virals led the doctor to make a very bad choice. 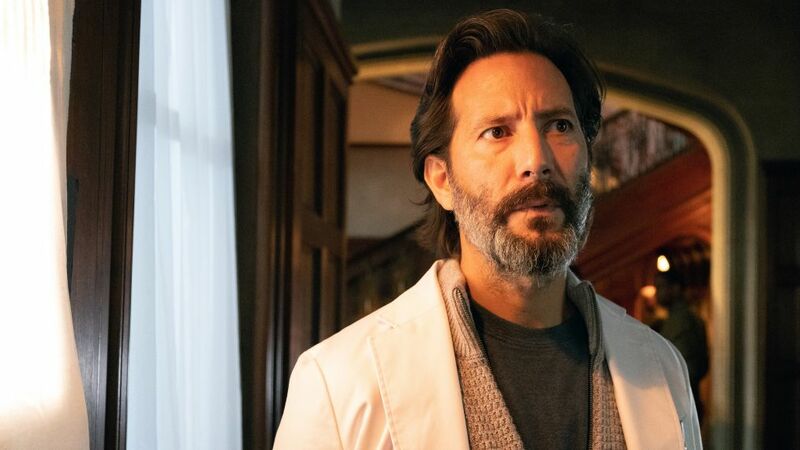 Though scary vampires haven’t been completely alien to TV in recent years (they showed up on FX’s The Strain and in Penny Dreadful), there aren’t many shows that are doing what The Passage is doing with them. Though pretty much everyone in Project Noah is being very careful not to call the test subjects the v-word, it’s clear from the way they’re guzzling blood and chomping on human necks that that’s what they’ve become. It’s interesting and refreshingly unique that on this program, vampires aren’t necessarily the outcome of a deadly viral outbreak. Rather than emerging in the aftermath of a disease the way zombies have on other programs, the lab coats on The Passage created vampires as an unfortunate side effect to a drug meant to treat all human illness — and now, in an equally unfortunate coincidence, they’re trying to get it functioning enough to combat a deadly disease that’s sweeping through the population at an alarming rate. It’s an interesting commentary in the same vein as Jurassic Park and other science-based flicks that feature protagonists “playing God,” often to a ruinous end. But enough about science. Back to vampires. At this point, the bloodsuckers on The Passage are so interesting because they’re not yet a threat, but the show is offering more and more evidence that they have the potential to become every bit as deadly as the disease they were created in an attempt to treat. Though vampires with supernatural powers aren’t a new concept, the way the bloodsuckers on The Passage are getting into people’s heads through dreams and thus influencing their decision-making is certainly intriguing. There’s also evidence they may retain some level of reason or even human empathy; one of the vampires chomps on a science lab janitor who was taunting and harassing her, but leaves his co-worker — a kinder, more reasonable dude — unbitten. In that way, The Passage’s potential catalyst for the apocalypse is perhaps more stimulating than other beings that have caused the downfall of the human race on sci-fi shows. For example, take zombies. While both zombies and vampires have their merits, the concept of a takeover by a new species that can think, reason, influence and infect people provides rich soil for a unique apocalyptic and even post-apocalyptic story to take root. Zombies are relatively slow and easily killed, unless they’re in a big group: we don’t yet know how the vampires on The Passage can be taken out, but we know they’re pretty quick and very manipulative. This isn’t to say one is better than the other — one only need peek at The Walking Dead’s ratings circa Season 4 or 5 to know just how well a good zombie story can resonate — but Fox’s drama has potential non-human antagonists that offer conflict on levels that zombies cannot, and unique thrills for fans of the apocalyptic and horror genres. It will remain to be seen whether The Passage adheres to its source material or chooses to deviate from it — as someone who has not read the book but understands enough to know a textbook adaptation would be a struggle, I agree with those who have said the drama has a steep challenge ahead in terms of how it utilizes Cronin’s novel and one specific time jump in particular. But at this point, based solely on the 90 minutes that have aired to date, the show is doing a good job of finding a human angle amidst the science and the burgeoning end of the world with the developing parent-child relationship between Brad Wolgast and Amy Belafonte (played by Mark-Paul Gosselaar and Saniyya Sidney). But perhaps most refreshingly, the drama is showing vampires as less something to lust after and more something to fear. For horror fans and fans of genre television, that's definitely worth sinking one's teeth into.